There are certain tools and handy accessories that every kitcar enthusiast should keep in their toolbox or on the garage shelf. Real essentials. One of these, is Contralube 770 a superb weatherproofing and corrosion protector for power and data connections, little areas where water gets in and can cause damage or where circuits have arc-ed out. The silicone-free product has recently been improved further and is recommended for multi-pin, bullet, spade and any other type of push-fit-type connectors, and is fully synthetic so you won’t have to worry about it evaporating. I first used it on my old BMW 3-Series (E46) that suffered the well-known rear light maladies that would knock out the tail and/or stop lights and kept throwing up error messages on the dashboard. An application of Contralube 770 fixed it immediately and made me a fan. I also experienced a similar issue with my Audi A6’s lights and it sorted them too. Excellent exhibition at the Yorkshire Event Centre last week! 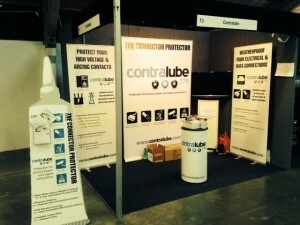 The Contralube team were there for the ELEX exhibition, Harrogate 2014. We met a good many existing customers and some great new prospect customers also….some great interest from the utility companies! We sold tubes and sachets on the day and were very surprised with our level of sales. After a successful debut at Sandown last year, the Contralube team are exhibiting at ELEX 2014 Harrogate, Yorkshire Event Centre on the 6th and 7th March. Contralube 770 has been reviewed by Total Kit Car (TKC) magazine in the January/February 2014 issue! There are certain tools and handy accessories that every kitcar enthusiast should keep in their toolbox or on the garage shelf. Real essentials. In our view, one of the very best is Contralube 770, a superb weatherproofing and corrosion protector for power and data connections, little areas where water gets in and can cause damage or where circuits have arc-ed out. The silicone-free product has recently been improved further and is recommended for all multi-pin, bullet, spade and any other type of push-fit connectors, and is fully synthetic so you won’t have to worry about it evaporating. I first used it on my old BMW 3-Series (E46) that suffered the well-known rear light maladies that would knock out the tail and/or stop lights and kept throwing up error messages on the dashboard. An application of Contralube 770 fixed it immediately and made me an instant fan. I also experienced a similar issue with my Audi A6’s lights and it sorted them too. We are delighted to be finalists at The Electrical Industry Awards 2013! Contralube 880 is a finalist in the category of Innovative Power Product of the Year. The announcement of the winners and the presentation of the awards will take place at The Royal Garden Hotel, Kensington on Thursday 24th October 2013. The Contralube team will be there…acceptance speech on standby! If we don’t win, we’ll have our best ‘Oscars face’ ready and pretend that we didn’t care anyway…and that we are really happy for the winners (neither of those will be true though).